Maine has had a bottle redemption law since 1976, one of only 10 states to have one. Consumers in Maine pay 5 or 15 cents per beverage, depending on the size, which they can recoup if they bring their bottles to a redemption center. That's incentivized Mainers to recycle up to 90 percent of the bottles, keeping them off roadsides and out of landfills. That's estimated to be about four times more than in states without a so-called bottle bills. But the beverage industry says the system is riddled with problems that costs distributors, and ultimately the customer. And they want the state to reconsider its bottle bill. "Fraud is in the system at a lot of different ways," says Ray Dube. At the Coca-Cola distribution facility in South Portland, Dube oversees the collection of returnables from redemption centers. He says too often, workers find bottles from New Hampshire--which doesn't have a bottle bill and whose bottles aren't labeled as such--that people are trying to pass off as purchases from Maine. "For the most part, we try to believe everybody is good," Dube says, "but there are a lot of bad apples." Dube says that Thursday's indictments of a couple from Kittery and a Massachusetts man only underscores his point. The three are accused of trying to pass off no-deposit containers purchased out-of-state to net more than $10,000. The Maine Beverage Association says distributors lose nearly $8 million a year from fraud. The group's spokesman, Newell Augur (above at podium), says distributors are already paying handling fees to redemption centers--up to 4 cents per bottle. "So that amounts to, if you figure about 1 billion continers sold in the state of Maine a year, that's on the order of about $30 million a year in handling fees," Augur says. "Then on top of that you have all the labor costs to process and pick up those containers." In other words, the bottle bill program costs the industry a lot of money. But Augur says it doesn't make sense to have distributors criss-crossing the state to pick up recyclables, burning up gas, when increasingly communities have recycling programs that take all kinds of recyclables, ranging from paper to cardboard to bottles. Augur pointed out that before Delaware repealed its bottle bill last year, it instituted a new program to continue to encourage recycling. The five cent deposit became a four cent fee that went toward a recycling fund. "The state division of air and waste is providing grants to the individual communities to develop single-stream recycling programs." Augur says that the Beverage Association is not suggesting a wholesale repeal of Maine's redemption law, as one piece of legislation aims to do, but does support a bill that would create a task force that would look for alternatives to the bottle bill. "We think that that's trying to fix something that is not broken and trying to take us in the wrong direction, and it would only would benefit the big beverage corporations," says Matt Prindiville, with the Natural Resources Council of Maine. Prindiville says that beverage companies are overblowing the issue of fraud and using it as a reason to get rid of bottle bills around the country. 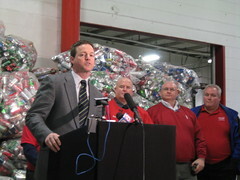 "They have a coordinated campaign around the country to repeal successful bottle bills," Prindiville says. "Bottle bills are the country's most successful recycling program. 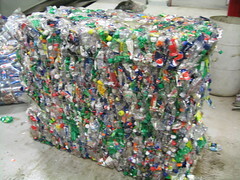 Even the worst bottle bill-performing states recycle over 75 percent of their beverage containers." Attempts to weaken or repeal the bottle bill, typically by Republicans, have come and gone over the last several years. What's different this time around is that Republicans now control both houses of the Maine Legislature, and the governor's office. But at Boot's Bounty drive-through redemption center in South Portland, owners Tim Boutot is not worried, even though changes of the bottle bill could put them and an estimated 800 redemption centers out of business. He says Mainers have come to appreciate the bottle bill and won't let it go away. "To take something away from the state that is working for the state, and keeping the roadways clean and keeping the recycling process in the loop that it should be, wouldn't make sense to get rid of such a process," Boutot says. Boutot says that the bottle bill has become a big part of Maine life. Many people use it as a fund-raising tool. Customer Susie Conkle of Portland, who was unloading bags and bags of bottles at Boot's Bounty, is a perfect example. "And last year with the help of bottles and loose change, I helped raise over $20,000 for Maine Children's Cancer," she says. Conkle says without a bottle bill, she would still recycle bottles but she thinks a good percentage of people might not.